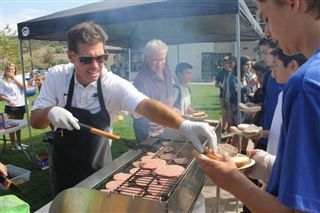 On Friday, September 11th, faculty, students and staff stayed on campus long after the final bell of the school day to enjoy good food and great company during the annual community BBQ. 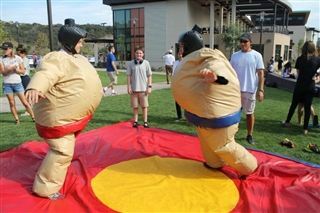 Faculty and student council members served up hot dogs and hamburgers at two grilling stations, while students tested their strength and endurance during rounds of crowd-pleasing Sumo Suit Wrestling, and fun face-offs at the inflatable obstacle course. The event was a great way for the community to celebrate the first seven days of school and kick-off the exciting year ahead!